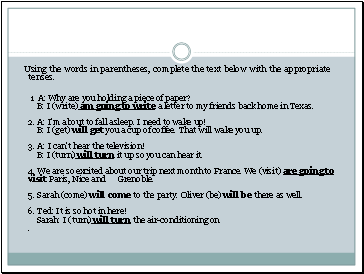 Using the words in parentheses, complete the text below with the appropriate tenses. 1. A: Why are you holding a piece of paper? B: I (write) am going to write a letter to my friends back home in Texas. 2. A: I'm about to fall asleep. I need to wake up! B: I (get) will get you a cup of coffee. That will wake you up. 3. A: I can't hear the television! B: I (turn) will turn it up so you can hear it. 4. We are so excited about our trip next month to France. We (visit) are going to visit Paris, Nice and Grenoble. 5. Sarah (come) will come to the party. Oliver (be) _there as well. 6. Ted: It is so hot in here! Sarah: I (turn) the air-conditioning on. 1. A: Why are you holding a piece of paper? B: I (write) am going to write a letter to my friends back home in Texas. 2. A: I'm about to fall asleep. I need to wake up! B: I (get) will get you a cup of coffee. That will wake you up. 3. A: I can't hear the television! B: I (turn) will turn it up so you can hear it. 4. We are so excited about our trip next month to France. We (visit) are going to visit Paris, Nice and Grenoble. 5. Sarah (come) will come to the party. Oliver (be) will be there as well. 6. Ted: It is so hot in here! Sarah: I (turn) the air-conditioning on. 1. A: Why are you holding a piece of paper? 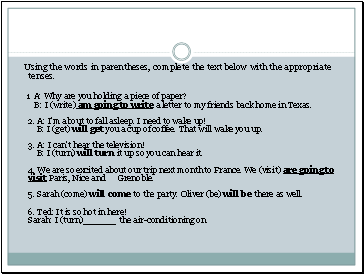 B: I (write) am going to write a letter to my friends back home in Texas. 2. A: I'm about to fall asleep. I need to wake up! B: I (get) will get you a cup of coffee. That will wake you up. 3. A: I can't hear the television! B: I (turn) will turn it up so you can hear it. 4. We are so excited about our trip next month to France. We (visit) are going to visit Paris, Nice and Grenoble. 5. Sarah (come) will come to the party. Oliver (be) will be there as well. 6. Ted: It is so hot in here! Sarah: I (turn) will turn the air-conditioning on. .